Moving home can be extremely stressful at the best of times, however for those brave enough to move during the holiday season the heat is on to get packed up and into your new property in time for Christmas Day. To help you on your way, we have compiled our 5 steps to a successful festive move so all you have to worry about is leaving a mince pie and carrot on the mantelpiece for Santa and Rudolph come Christmas Eve! As ever the weather is one thing you cannot plan for, however being as prepared as possible for the worst weather winter can throw at you will stand you in good stead for your festive move. Snow is one of the most magical things about the holiday season, but a white Christmas can spell disaster for those moving home. Make sure you have plenty of salt to hand to clear entry points and driveways for your removal company, as well as friends and family members helping you move your belongings. If moving day arrives and it is particularly icy, exercise caution when moving heavy loads. Most importantly, always have warm clothes to hand for you and your family to ensure you are prepared and ready for action when moving. As well as planning ahead for the elements, make sure you book in advance when hiring your removal company. The Christmas season can be a particularly hectic time for many businesses, and as staff numbers fall during the festive period, many removal services will have limited availability. 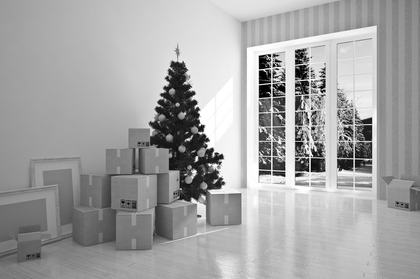 It is recommended that you book your removal service a month or two in advance if you are planning a holiday season move to avoid disappointment and get you one step closer to Christmas in your new home. As soon as your move has been confirmed always notify your utilities provider of your upcoming change of address. The winter weather can be particularly harsh, so notifying them of your move in date will prevent mix ups with your heating, hot water, gas and electricity, leaving you to greet a warm and cosy new home with everything you need to cook your turkey on Christmas Day. Always share your move in plans with friends and family too to prevent any Christmas cards and presents from getting sent to your previous address. Recovering these can be a real hassle, especially during the busiest time of year for mail services. Whether you are moving to the next street or a whole new state, make sure you make festive family time a high priority. Keeping up with Christmas traditions when you arrive at your new property will make it feel like home. Prepare a clearly labelled Christmas box full of all your festive treats and decorations so you have everything you need to make your first Christmas extra special – even if you are eating your Christmas pudding off a paper plate or climbing over boxes to hang your mistletoe! This post was written by Brittany Thorley from Cheshire Demolition, a salvage and reclamation company that assists thousands of homes in decluttering their properties before moving home every year.